Blepharoplasty is the medical name for the surgical removal of excess eyelid tissue. The excess tissue is most commonly skin, but often fat and muscle are additionally removed from the eyelid, depending on the needs and appearance of each specific patient. This information sheet will focus on excessive skin in the eyelid (dermatochalasis) and surgery to correct this. Excess skin and/or protruding fat can be present in one or both upper or lower eyelids, but is most common in the upper lids. The excess skin can droop in front of the eye, blocking the upper vision and can be a cosmetic problem. It can also cause an uncomfortable heavy sensation, which can cause fatigue particularly when reading or concentrating. Sometimes the skin can sit on the eyelashes cause discomfort or pushing the eyelashes into the visual field. Finally excess skin on the outer side of the upper eyelid sometimes tracks tears in the wrong direction (‘wicking’) causing a watery eye. Excess skin most commonly occurs with aging, but sometimes occurs in younger age groups and can run in families. It is sometimes associated with ptosis (drooping of the upper eyelids – see ptosis information sheet for further details). What will happen at my hospital appointment? I may also book you a pre-assessment appointment depending on the type of anaesthetic that will be used (see below) and any other medical conditions that you may have. How is excess eyelid skin treated? The most common blepharoplasty operation involves carefully assessing and marking the excess skin and excising (cutting out) it. I will discuss with you how much skin and additional eyelid tissue (usually fat) to remove. The incision for the surgery is almost always made in the skin in the existing eyelid crease (skin fold). The skin incision is closed with sutures that are removed 1-2 weeks after the surgery. I take a photograph prior to the operation so that we will be able to compare the position of the lid after surgery. The operation takes about 20-35 minutes per eye and is almost always a day case procedure, with no need for an overnight stay in hospital. It is usually done with local anaesthetic (injections to numb the eyelid skin). However, occasionally, for example for patients with severe tremor or anxiety, I use sedation, which makes one very sleepy during the anaesthetic injections and relaxed and a little sleepy during the operation. If both eyes have requires blepharoplasty surgery it is usually best to operate on both sides at the same time to give the best chance of a symmetrical result. There are other blepharoplasty operations, for example, lower eyelid fat only blepharoplasty, that are used in specific situations that are not discussed in this information sheet. 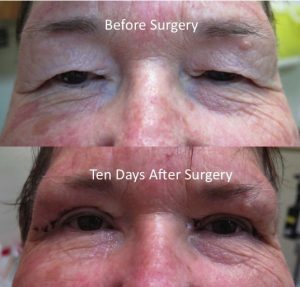 What are the possible complications or risks of upper lid blepharoplasty surgery? Unsatisifactory eyelid appearance or symmetry: at least 95% of patients are corrected satisfactorily after the first operation. Approximately 5% or less may require a further surgery to improve the appearance of one or both eyelids. Recurrence: the exces skin does gradually recur in time, although usually many years or decades after the initial operation. This may require a repeat procedure to correct again. The local anaesthetic will wear off in the first 1-4 hours after surgery. At this time the eyelid can become quite painful. You can take simple painkillers such as paracetamol or ibuprofen if you have no allergies or contraindications to these. If you are in pain on the ward, please ask the nurses for painkillers. It is common to have bruising of the eyelid or the whole area around the eye after eyelid surgery. You may have a ‘black eye’, which can take a week or so to settle down. There also may be a scab along the suture line or some numbness of the upper eyelid. Infection is uncommon after eyelid surgery, although any wound can become infected. Infection will cause the eyelid to become increasingly red, swollen and tender a few days after surgery and there may be some discharge. If this occurs you should contact me immediately. The eyelids may feel ‘tight’ after surgery. Inability to close the eyelids after surgery (lagophthalmos) happens very occasionally. Eye lubricating cream can be used to keep the surface moist and comfortable the this usually settles with time. The eye can feel a bit gritty or dry after surgery. This can usually be managed with artifical tear/lubricant drops, gels or creams and almost always settles in time. Lower lid blepharoplasty surgery is much less commonly undertaken than upper lid surgery. It is a more challenging operation with a greater risk of an unsatisfactory outcome and should only be undertaken by a surgeon with training and experience in this procedure. The major additional complication is that excision of excessive skin can cause the outer side of the lower eyelid to curve downwards slightly (lid retraction). This usually improves in time, but occasionally continues to have a poor cosmetic appearance and very rarely revision surgery, sometimes with skin grafting is required to improve it. If you smoke I would recommended that if possible you stop smoking for at least 3 days prior and 1 week after surgery. This is important as smoking impairs wound healing and increases the risk of infection. Avoid alcohol for a day before and a day after surgery. If you are having sedation or general anaesthetic, you are required to have nothing to eat or drink for at least six hours before surgery. An eye patch is often placed over the eye after surgery. You can remove it the next morning unless the nurse or doctor gives you different instructions. If surgery has been done on both eyelids, one of these will be removed before you go home. You will be given drops and ointment to use and a clinic appointment will be made for a check up about a week later.